What happens to a federal government department that, over the years, has been almost too successful? This seems to be the strange plight of the Department of Agriculture, which during its 100-year history has helped produce a quiet, 20th century economic miracle. In fact, Rhode Island University's Professor Edward Higbee says that the "improved efficiency of modern American agriculture is as fabulous as the conquest of space, and far more significant for the welfare of mankind." All of which brings us to the Department of Agriculture's Yearbook, published by the Government Printing Office this week. It's a far cry from the stodgy publications of even a generation ago—columns of facts and figures collected to serve what was called the "backbone of the nation"—a vertebrae of millions of American farm families whose horse-and-hand labor sweated an uncertain living from the earth to feed themselves and our towns and cities. Up until some 20 or 30 years ago, the farmer was the most important and powerful economic and political force in the nation. And to serve this land-tilling electorate, a succession of farm-dominated Congresses set up scores of bureaus, programs, and agencies under the Department of Agriculture to keep the rural folks happy. It was good politics at the time, and in the long run it made superb, scientific good sense. Thus the federal government found itself providing free advice and counsel to the tillers of the soil—a program that more and more expanded to include other sections of the nation's life. I remember my grandmother sitting down in the kitchen of her Ozark farm and writing a letter to Washington asking how to keep copperhead snakes from crawling under the back porch at night. I believe she got a pamphlet back with pictures identifying the poisonous reptiles of America and instructions on what to do about snakebites. But Grandma, and millions of other people, knew that if she wrote to the Agriculture Department she'd get an answer—usually one more helpful than in the case of the indigent copperheads. Since the 1935 peak when the nation had almost 7-million farms, there now are about half that number. By 1970, so say the experts, America may have only a million and a half farm units. Behind this agricultural miracle is productivity—in 1920, it took one farmer to feed eight persons. Today, one farm worker produces enough for 31 persons. 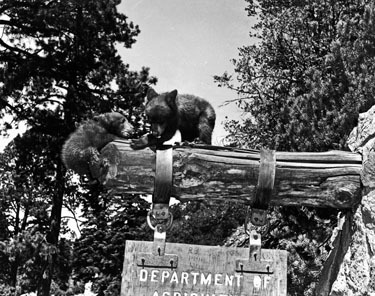 In the new Department of Agriculture Yearbook, Secretary Orville Freeman has recognized the inevitable. Although the nation has a food surplus on its hands, Secretary Freeman is running short of farmers for his Department to serve. And that's the reason that this year's Agriculture Yearbook has a radically new, all-inclusive title. It's called "Consumers All." The reason, Secretary Freeman explains, is that "although the primary objective of the Department is service to the United States farmers and ranchers—the real beneficiary of agricultural productivity and abundance has been, is now, and will continue to be the American consumer." Consequently, the new Agriculture Yearbook has been written to serve the most dedicated suburbanite or metropolitan cliff-dweller as well as the man who knows which end of the cow to milk. The book, "Consumers All," makes "energy-saving" suggestions—such as mapping traffic patterns through the kitchen to cut down on the 10-miles a day the housewife might walk to keep up with her family duties. In an excellent chapter on shoes, the Yearbook points out that the average, healthy 7-year-old boy takes 30-thousand steps a day, which adds up to some 800 collective tons of running, jumping, and kicking every 24 hours. It solves the mystery of why junior always seems to be oozing out at the toes. "Consumers All" gives tips on gardens, mending clothing, and even tells you how to buy a house. The other day we heard an architect tell a story about a lady who wanted to build a house. She was a bug on Early American, and she stressed time and time again that she wanted the living room Early American with hooks above the mantle for a musket—everything Early American. "And the bathrooms," she added, "I want them Early American, too." "Yes ma'am," the architect replied. "Just how far out in the backyard do you want it?" Out of curiosity we checked the new Agriculture Department Yearbook. Sure enough, under a chapter primly titled "Disposal of Wastes" there's a section on the "earth-pit privy." The Department of Agriculture Yearbook makes fascinating reading despite its "Consumers All" title. It costs $2.75 if you buy it from the Government Printing Office. But it's available—or soon will be—in your nearest public library.